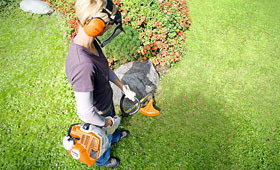 The handy lightweight STIHL brushcutters add the finishing touches in garden care or landscape maintenance. They are the ideal complement to motor mowers and are used wherever the work of the mower needs finishing. Small areas of grass can also be mowed quickly with these machines. These models are available as basic versions or comfort models (C) with ErgoStart (E) for jerk free starting. Transform overgrown wildernesses into perfect lawns. When you need powerful performance.